So begins the entry for New Year’s day in Dans Paris occupé: Journal d’Hélène Pitrou—the fictional diary of the fictional French schoolgirl, created by writer Paule du Bouchet. That she hear news from her father (who had been languishing in a German P-o-W camp but has escaped). That she become stronger and more courageous. Hélène’s diary, like the war, will continue. As for ‘a possible landing by the Allies’: Dieppe had proved a disappointment and Normandy was more than a year away. 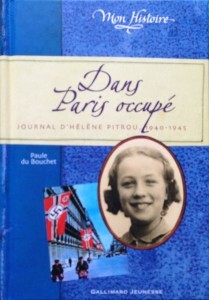 This entry was posted in Book, World War II and tagged Dans Paris occupe, Helene Pitrou, Paule du Bouchet. Bookmark the permalink.